Our advice stems from having over a decade of board recruitment experience, having interviewed thousands of candidates, spoken to hundreds of Chairs and in reviewing 10,000+ CVs – we know how and why people get appointed to boards. Most board directors describe finding their first directorship as arduous and time consuming. It is often said that finding a second and third role is equally as difficult! As such, I am often asked what advice I would give to anyone wanting a board position. My immediate answer is always to start looking well before you need one. Beyond this there are six things that you should consider before getting started. Landing your first, or subsequent, board seat is no easy matter. For many gaining an opportunity to serve on a board can be arduous and the question most commonly asked question remains, “How do I get on a board?” Motivations and experience aside following this practical advice could increase your chances of being able to serve on a board. Whilst there is no such thing as a perfect board candidate understanding what boards look for in potential board members should go some way to you answering this question for yourself. In my many past years as a Board and Executive Recruiter I have had countless conversations with both CEO’s looking for their first independent Non Executive role and with Chair/Nomination Committees considering CEOs for their boards. A question that will undoubtedly come to mind as you start your journey to becoming a Board Member, is the question of how much you can expect to be paid as a member of a board. The amount a Non-Executive could earn depends on a number of different factors. Gaining a board appointment is a highly competitive exercise so it is critical you understand how people are appointed, what will separate you from your competitors. This comprehensive resources pack will guide you through the minefield of NED recruitment – from finding a suitable board role to preparing for a board interview. Contained within are all the tools and templates you need to “dare them not to appoint you” including: Board CV & Cover Letter templates and a comprehensive list Board Interview Questions plus much more. 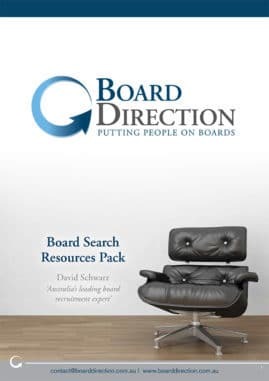 Full access to our comprehensive suite of board search articles.